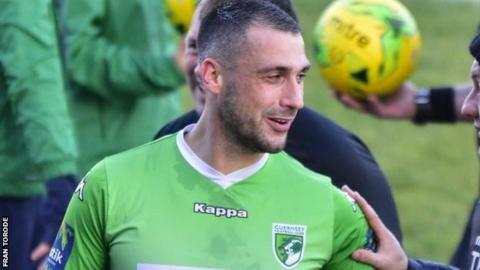 Jamie Dodd says he has no intention of quitting Guernsey FC after breaking the club's all-time appearance record. The 29-year-old played his 271st game for the Green Lions in their 2-0 loss to Hythe Town on Saturday. Dodd did leave the club in February 2017, but returned to action for the Isthmian League side later that year. "I'm going to keep playing as long as I can, I enjoy it and now we've got a bit of a younger team it keeps me going and I really love it," he said. Dodd scored on his Guernsey FC debut on 1 October 2011 in a 3-0 win at South Kilburn and has been part of the side which recorded back-to-back promotions from the Combined Counties League Division One to the first division of the Isthmian League. He also helped the club reach the semi-finals of the FA Vase in 2013. "It's a great achievement personally, it's quite a number," Dodd added to BBC Radio Guernsey after surpassing Dominic Heaume's record of appearances. "To pass someone like Dom, and I've seen first hand the commitment he put in, is pretty special."